Immediate payment of £6.44 is required. Product as described and fast delivery. thanks. I have never had to diet before so l thought it was going to be difficult counting the calories but it soon falls into place quite an eye opener actually the calorie content of some foods,l am pleased with how easy this diet is to manage. Interesting read, covers the subject well, although has a reserved feel. Best way to loose weight, Well worth a read. Alt similar book - "The Complete Guide to Fasting" Jason Fung / Jimmy Moore. Unfortunately we have mislaid our original copy of this book when we moved, so this one is a replacement and we also gave another to a friend. This diet really does work - without being too hard to do! 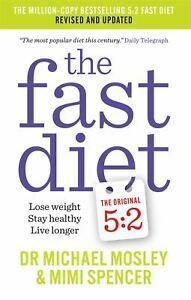 Fast Diet contains many thought provoking ideas for recipes and general advice on how to diet. I have needed to buy other books though to supplement the dietary advice and finally settled on a 5:2 regime and recipe book.